providing and disseminating recommended standards for the development and implementation of pre-service, in-service, and graduate training opportunities in gifted education. The Professional Development Network annually awards a Professional Development Award. The Award recognizes an individual(s), institution, or organization for planning and implementing sustained professional development on gifted education. Congratulations to Diane Cassidy and the Pikes Peak Gifted Educators, 2018 Professional Development Award recipiens for their program. 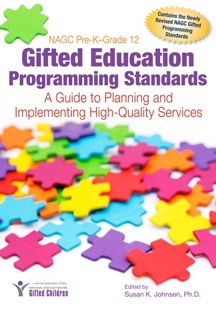 The program may relate to any age level within the gifted education context and be given to educators and service providers in PreK-12 or higher education. For more information: Award Flyer, Application Form, and the Verification Form. You may also download the Application Checklist. For any questions, contact Karen Brown. Ensure that the learning needs of advanced students are being met.